The administrative capital of the 'Region Lorraine', Metz is a city of 123,000 inhabitants within a conglomeration of 47 municipalities and 323,000 inhabitants. 75 million people, and a large proportion of the production capacity of industrial Europe are situated within a radius of 300 km. The conglomeration of Metz is situated at the crossroads of two main roads running from the Mediterranean to the North Sea and from Paris to Eastern Europe. The railway network makes all great European great cities accessible. With the arrival of the ´High Speed Train' (TGV) in 2006, travel time to Paris will be reduced and the eastward link will be consolidated. In terms of freight traffic, the largest marshalling railway yard in France is situated in the conglomeration. The airports of Metz- Nancy-Lorraine, Luxembourg and Saarbrucken represent the main European and international connections. With regard to waterways Metz, is traversed the canalised 'Moselle' river, the main French river port for cereals. • a rapidly expanding university ( 22 000 students), six high schools (engineers' national school, college of electricity, Georgia Technology Centre) and research centres. With three thousands years of history, Metz possesses a rich, diversified, original patrimony, which is the basis of its attraction to tourists. The City has, since the beginning of the 1980's, pursued a dynamic policy of the development and conservation of this patrimony; the restoration of frontages, the creation of a conservation area, and development of pedestrian streets. But Metz has in addition tried to increase its attractiveness by developing culture. The cultural policy is more and more considered to be an important factor of economic development. Museums, art galleries, municipal archives and the media library are facilities which contribute to the attraction of the city. But Metz also has a very musical tradition: the Gregorian Chant was born in Metz in the 8th century. 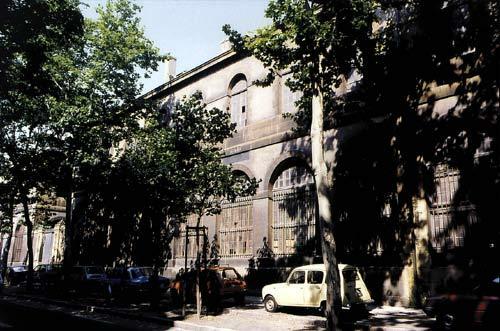 Moreover, the musical climate is very lively and a number of prestigious projects are based in the city: the Lorraine's Philharmonic Orchestra (70 musicians), the Opéra-Théâtre (more of 100 annual representation), 'le Caveau des Trinitaires', which privileged the jazz, and the National Conservatory. Furthermore, music schools and numerous associations organize all kinds of concerts, musical spectacles and festivals. 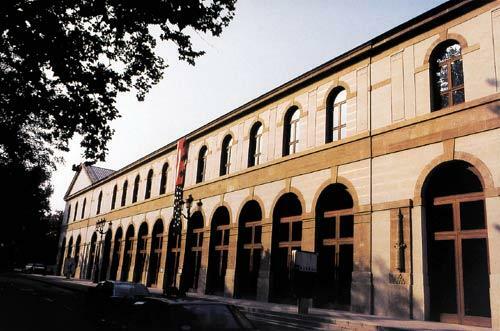 Aware of the disparity between its theatre, built in the 18th century, too small (650 seats) and not always available, and structures such as the sports hall, 2000 seats but not adapted to music, the municipality of Metz decided in 1978 to launch the project of a concert hall. Several sites were then envisaged to locate this new facility (and more specifically the grounds of the former fair). The site reserved was the Citadel, on which is situated the ancient 'Arsenal Ney'. It is located right in the heart of the city, near pedestrian and shopping streets, in the neighbourhood of an ancient French church , St Pierre-aux-Nonnains, Roman basilica of the 4th century, and of the chapel of the Knight Templars (13th century), in its original state, and built according to an octagonal plan. It adjoins the esplanade, with its flowerbeds and trees, lined by the 18th century Law Courts. The site also has the advantage of the proximity of two easily accessible parking areas whose total capacity is about 1800 places. This site allowed the city to develop the project while at the same time restoring life in the district. Built from 1859, the arsenal was a store for weapons and ammunition. It preserved this function until the end of the second world war. In 1968, it was given up to the city of Metz. Although not being a masterpiece of military architecture, the arsenal constituted an interesting building which deserved to be preserved. 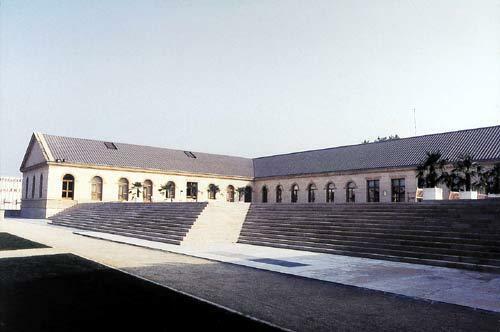 The realization of the concert hall was the subject of an international competition, started in 1983. In 1985, the project was awarded to the Catalan architect Ricardo Bofill, in association with the Longo and Gibert-Hypolite architectural consultancy. The opening of the project on the site of the Citadel and the easy traffic circulation and access to the various sectors were important determinants in this choice. 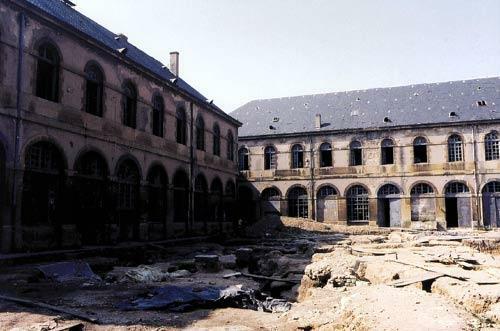 The arsenal was a quadrangle; Bofill removed one of its sides and opened a vast terrace in the rear which established a meeting area, also for both other ancient edifices, St Pierre-aux-Nonnains and the Chapel of the Knight Templars. Under the square created between the aisles of the building, the concert hall is located, three-quarters buried. The regular lines of the arsenal were preserved. Windows open in a classic frame in Jaumont's stone (the local material - 'the stone of sun' - which was used for the construction of the main public buildings of the city, in particular the Cathedral and all the buildings of the 18th century) put on by a Roman arch decorated with a stony key. Facades are plated by an Italian honey-colour stone, joints are in brass. Roofs are in lacquered bronze-like metal. The facility consists of a concert hall with 1500 places ('la Grande Salle'), a room with 350 places (the hall of the Esplanade), a reception hall, (the Governor hall, 400 square-metres), a showroom of 500 square-metres, a shop and a restaurant. The concert hall is decorated with columns and with wooden classic pilasters (beech and sycamore) for acoustic reasons. The warm colour of the decoration evokes the furniture of marquetry or ancient musical instruments. Ceilings are established by boxes in staff finalized by the acousticians. The dimensions are placed next to those of 'Musikverein' of Vienna; the volume of the room is about 13 600 cubic meter. The Arsenal is connected to the underground parking area (enlarged by 250 places) by a gallery. • to interest a wide public in a diversified programme and a dynamic commercial policy. The programming of the Arsenal comprises 10 themes: 'Prestige' (philharmonic orchestras), the baroque, choir, ancient music (in particular Gregorian chant), jazz, dances, music of the world, song, youthful public and exhibitions. Operas remain the domain of the Opéra-Théâtre . • to enliven the Arsenal as a place of culture but also a stopping-off place by supplementing the concert halls with an exhibition gallery and a shop and by the two ancient memorials situated in the surrounding wall of the Citadel. 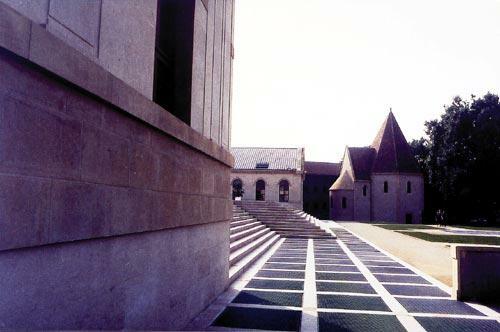 The Chapel of the Knight Templars and St Pierre-aux-Nonnains, refurbished as showroom and concert hall for the Gregorian Chant, participate in the same project and benefit from the dynamic of the location. Another dynamic factor is that the Arsenal is open every day. • to make of the Arsenal a place of international repute by developing an ambitious artistic policy (invitatiosn to the greatest artists and contemporary actors). The project of the Arsenal can be regarded as a success in that 200 performances are organized every year, frequented by a total of 120 000 people. Catalyst of all types of music, key centre for contemporary dance, melting pot of a new public, stopping-off place for the greatest artists and contemporary actors the Arsenal represents a renewal of cultural life. From the point of view of the town planning, the realization of the Arsenal allowed the whole district of the Citadel to be rehabilitated. What remains is to rehabilitate the building instated on the site : 'le Magasin aux Vivres' ('the supplies store' - 16th century). A luxury hotel project is actually under study.